It's a handsome species with its elegant tail, white breast, and chestnut wings and back. . It's not one you would stumble across everyday, as they are quite secretive in their habits. 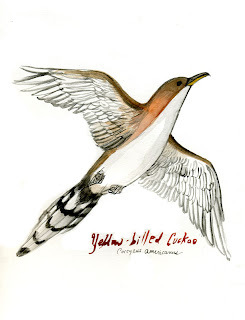 Like so many other once common species, Yellow-billed Cuckoos are experiencing a sharp decline in numbers, due to (suprise suprise) habitat loss and pesticide use. Like other cuckoos, such as the Black-billed and Old World cuckoos, americanus will engage in periodic bouts of brood parasitism. This means that they will occasionally lay their eggs in the nests of other species, such as robins, catbirds, and Wood thrushes, to be raised by these unwitting hosts.